Sometimes it's the little things that make it all worth getting out of bed; a warm spring day, (we're setting records here in Woodinville WA - sorry mid-west! ), the way your dog greets you when you come through the door, or surrounding yourself with things that make you happy. For me, it's thrifting. When I score one of a kind finds, I get the same feeling you get when you find a twenty in the pocket of a seldom worn jacket! Bonus! Surprise! It's this thrill that keeps me a familiar face around the local Goodwill. I really should have my own designated parking spot!! When I lived in my old house, with its three car garage and storage above my husband's shop, my little, ahem, "obsession" wasn't an issue. If I found a great deal, but didn't know exactly what I was going to do with said deal, at least I had a place to store it until I found it a more permanent home for it inside my home. Those days are gone and I have a much smaller patch of real estate. I love my not so large house, but my compulsion for finding cool one-of-a-kind pieces to add to my collections could have me starring on an episode of Hoarders. My solution? Rather than giving up my thrift store forays, I have come up with a few rules to avoid being buried under a collection of chairs. 2. Is it BROKEN, or does it just need a little love? Gorilla glue, paint, magic erasers, and good old fashioned elbow grease can, and have brought many a thrift store score back to life. 3. Where will I put it? This one is the hardest for me to follow. Since I have few pieces I am willing to replace and limited space for artwork, I need to make sure I have a place to put it. Gone are the days of, I love it, I'll find some place for it. With these three rules in mind, I found myself at a local thrift store looking for things I didn't know I needed and one that I did, a lamp. My husband had been complaining that his elbow kept hitting the lamp that sat on the end table next to the sofa in the great room. I was on a mission to remedy that situation fast. Done and done. I had found what I came for, I should just leave...I should just pay for my lovely lamp and walk out the door, or maybe, I should just have a quick little look around. I found myself looking at artwork. I had just finished my gallery wall in the living room, but I am always looking for cool artwork and sure would love to find a hidden Picasso or Matisse worth millions of dollars. A girl can dream. "$5.00!! Are you freaking kidding me? The frame alone is worth that much." "Where can I hang it? Remember the limited wall space?" "What about the wall by my desk? No, I like the mirror that's there. What about the hallway? 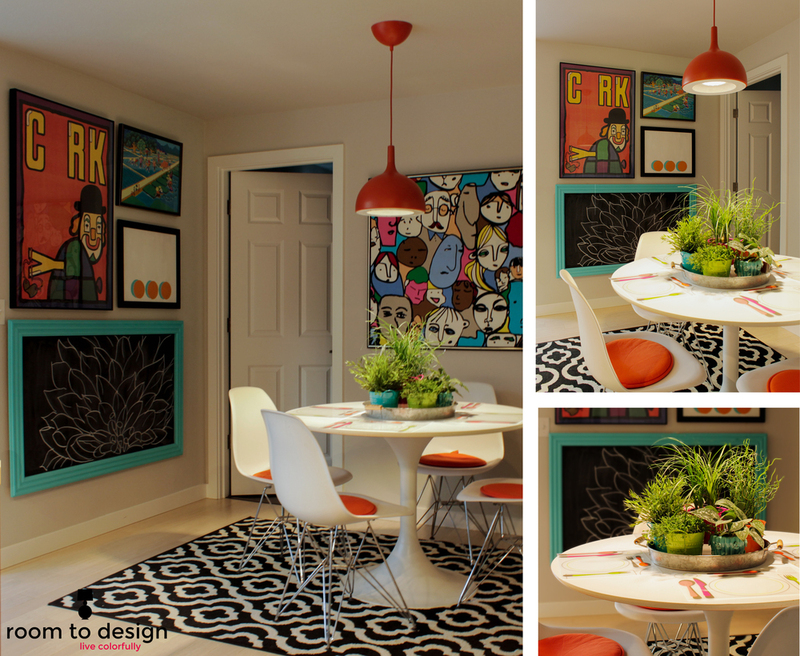 I could redo the artwork in the eating nook." "The frame has a few scratches, I could paint it and it would be fine." I can't tell you how long this went on, I was like a crazy person, walking away, walking back, I don't know why I was so indecisive. Yes, I do, because, well, Hoarders. I bought it. I broke two of my rules, I didn't really need it, and I didn't know what I was going to do with it, but I love it, and I suspected that it actually might be worth more that the five bucks I shelled out for it. 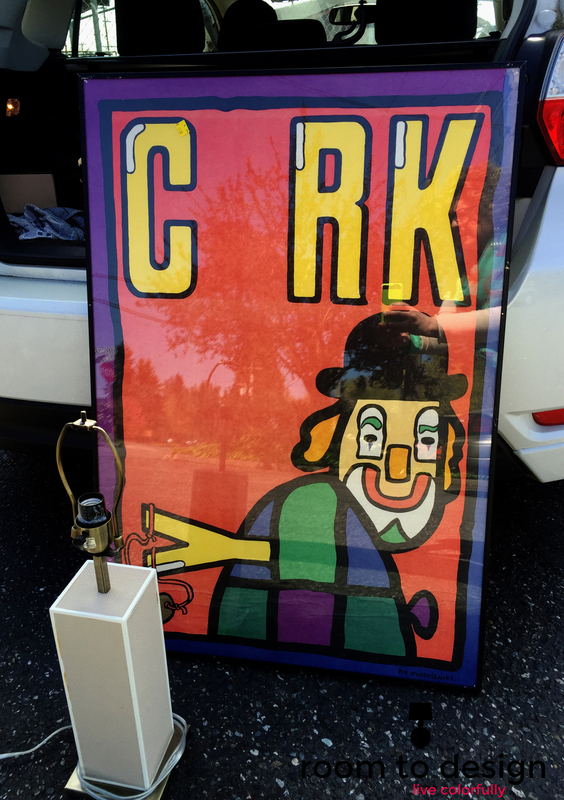 Turns out it's a Polish circus art poster from the 1960's probably worth $150 at the bottom range and $475 at the top. Score!! Now I just needed to some where to hang it. The color and the whimsical subject matter told me it wanted to live in my kitchen nook. But I already had pieces I loved there. I would have to do some re-arranging and some (gasp) editing. Hammer, nails, command strips, done. With that problem solved, back to the original issue... the lamp. A little clean-up with a magic eraser, a little glue to fix the shagreen, some paint and a lampshade (I just happened to have this one in my garage...cue the camera crew from Hoarders). 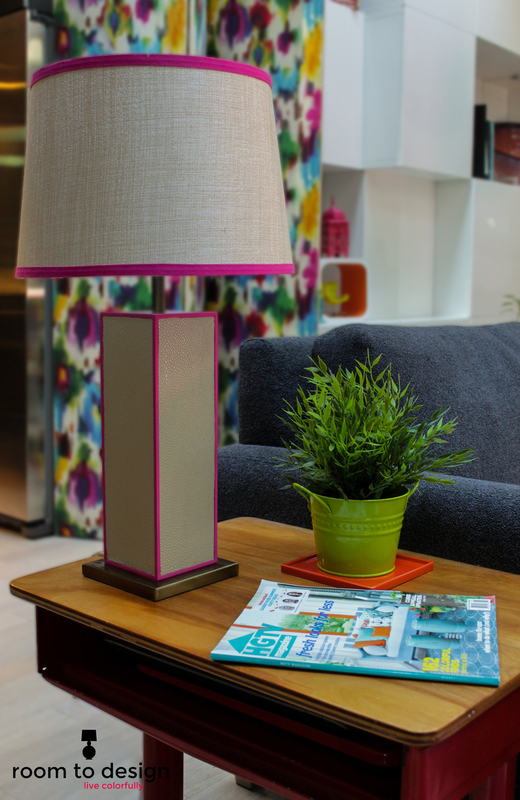 And new life for an old lamp. Here's where it lives now. If you have artwork you love but aren't sure how to display it, drop me a line. I can help you find the perfect spot, or create your own gallery wall so you can enjoy it every day!